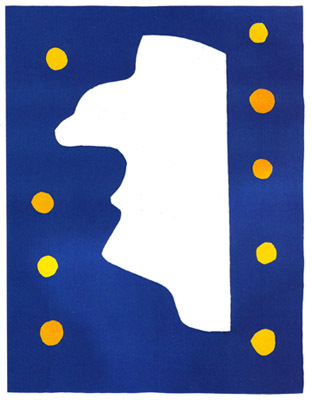 "South Pole, North Pole": thus Picasso is said to have defined the century's two most illustrious painters, those who played the greatest role in 20th century painting. 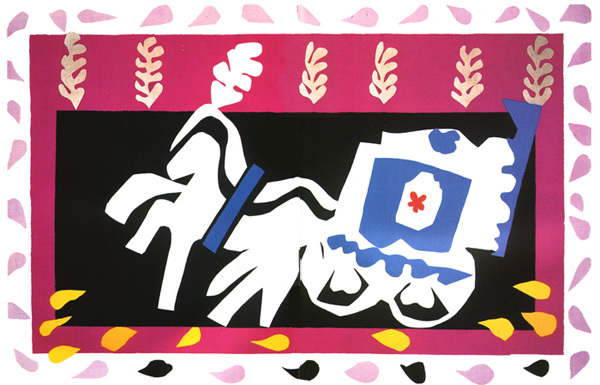 Matisse and Picasso were indeed great rivals, their relations over half a century founded on discreet friendship if not indeed complicity. The poet of colour found his counterpart in the breaker of forms. 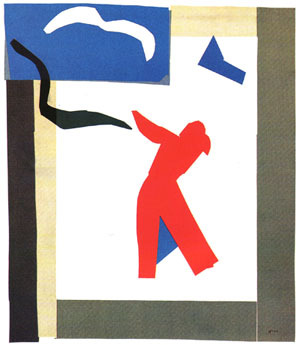 "I feel through colour," said Matisse, "so my pictures will always be organised by it. Yet this requires that the sensations be condensed and that the means employed be brought to their utmost expressivity." One of the hallmarks of a truly great artistic ceuvre is that it never stops at the discoveries it has made but immediately sets out in new directions. A single arc, the product of a single intention, this diversity can sometimes disorientate. When an artist further uses all the forms of expression - painting, drawing, and sculpture - simultaneously, the disorientation can border on bewilderment. 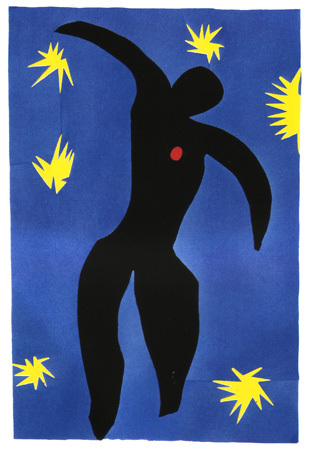 For Matisse, in his quest to refine form and exalt colour, the end justified the means, and he offered revolutionary solutions under the guise of classical appearances in the best tradition of French painting. It is this apparently innocuous revolutionary aspect that some still fail to perceive: this poised art, full of purety and calm mastery, this "joy in painting the beauty of the universe" stand out so clearly in an epoch when the absurd, the unquiet, the "convulsive" reigned supreme. 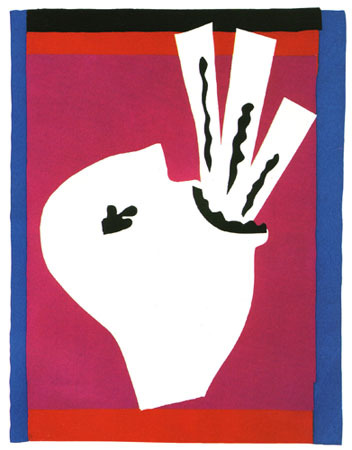 The gouache cut-outs from the end of his life have also been misunderstood. 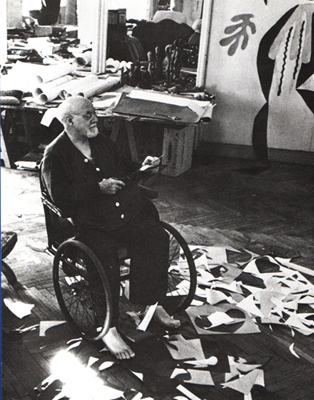 They have been taken for the last hobby of a crippled old man, whereas they are, like Matisse's Chapelle du Rosaire at Vence, "the end-product of an entire life of work and the flowering of an enormous, sincere, and difficult effort", of a life devoted to exalting colour and evoking the happiness of living and painting, which were, for him, inseparable. 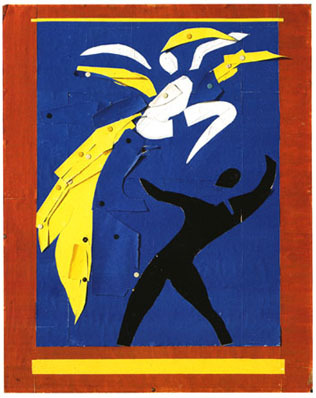 For the gouache cut-outs are continuous with a purpose from which the artist never departed after he had found himself as a fauve: the work is born of the untrammeled confrontation of colours. 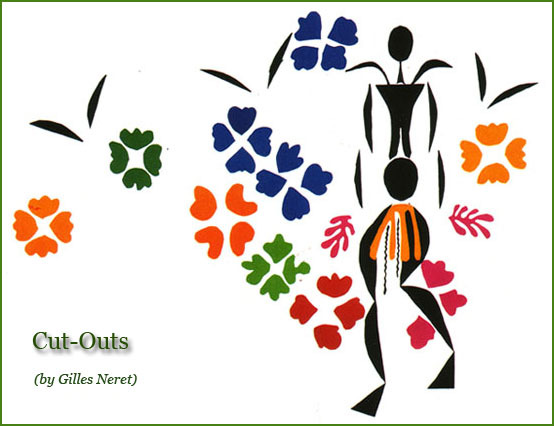 The preparatory drawings for the stained-glass windows were thus created using gouache cut-outs. After long reflection, the theme was drawn from the Book of Revelation: "In the midst of the street of it, and on either side of the river, was there the tree of life, which... yielded her fruit every month: and the leaves of the tree were for the healing of the nations". The Tree of Life, symbol of the Golden Age! The tree, the flower! 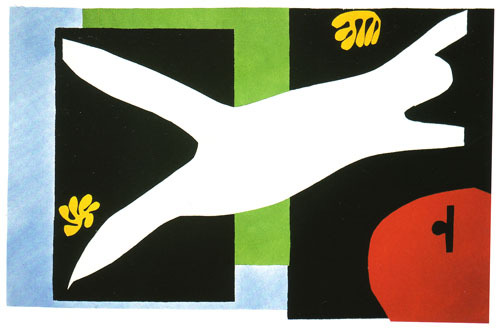 Is there any more beautiful leitmotif in the work of Matisse than this culmination of his habitual themes? 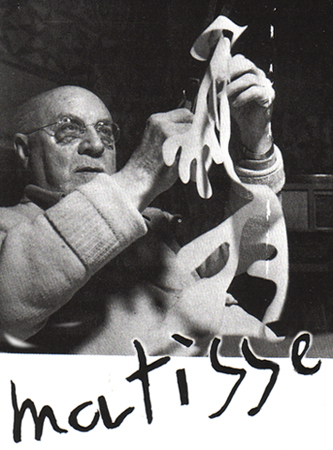 Picasso was furious that Matisse was creating a church. "Why not do a market instead? You could paint the fruit and the vegetables!" 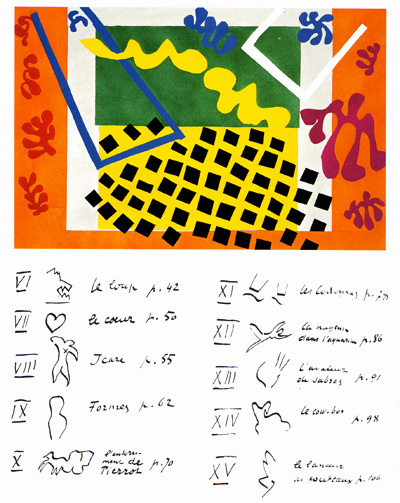 Around 1943, in Cimiez and later at Vence, in the sunlit South of France, Matisse felt that he had said all he had to say in painting. 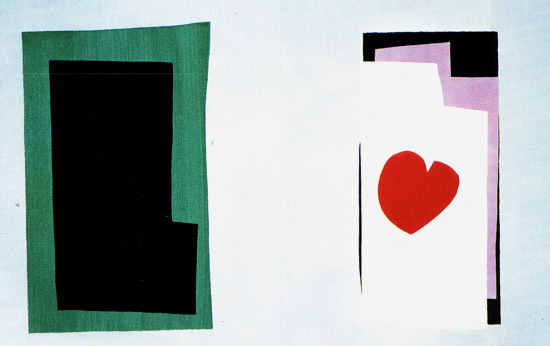 And he found colour difficult to manipulate because of his illness. It was then that he first had recourse to sheets of paper precoloured with gouache which he could cut to the shapes he desired. 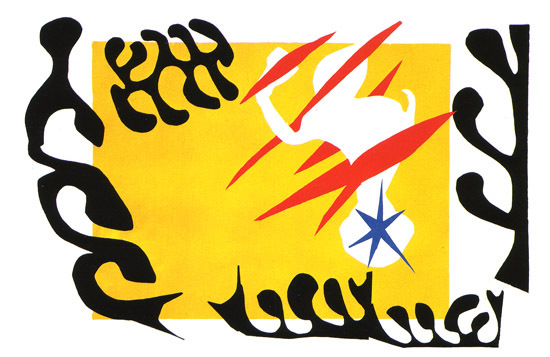 The result: the extraordinary Jazz album (published in 1947), "improvisations in colour and rhythm" - like those of a Louis Armstrong or a Charlie Parker - in which Matisse's memories of the circus, of popular stories and of his travels took form in vivid, violent images. To link them and to mitigate the contrasts between them. 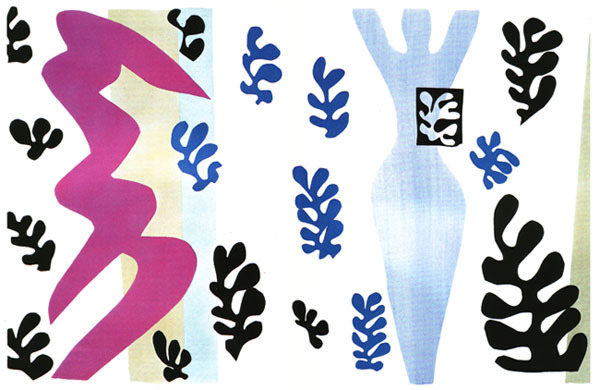 Matisse wrote an accompanying text, in a large, harmonious script, full of striking phrases: "Sculpting the living colour reminds me of the direct carving of the sculptors... My curves are not mad..."
Incredible man! He was now confined to his rocking chair or his bed and was, it might be thought, lost to painting. Yet he again found a way to transcend the art of drawing, grasping the desired opportunity to work towards a perfect synthesis of everything he had learnt. With nothing more than a pair of scissors and paper precoloured to precisely the shades that he had had prepared, he solved the problems of form and space, outline and colour, structure and orchestration which he had always sought to harmonize. Still more, this new enterprise at last allowed him to accord full importance to line rhythms and to forms, which he had often in the past had to sacrifice to colours and tonal relations. Here, realism and abstraction were reconciled at the end-point of a long process that grew out of its own logic and not, as some defenders of abstract art have impudently asserted, out of carelessness or the temptation to climb onto some contemporary bandwagon. 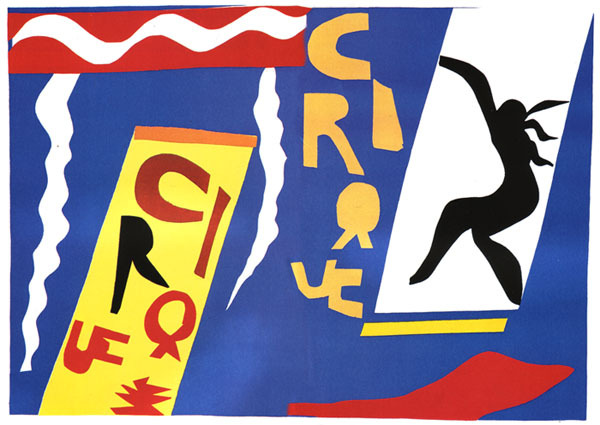 Matisse laid all ambiguity to rest when he wrote that he "drew in colour", and when he stated to Andre Lejard "I am currently focusing on material more matt and more immediate, and this leads me to seek a new means of expression. Paper cut-outs allow me to draw in colour. For me it is a question of simplification. Instead of drawing the outline and establishing colour within it, I draw directly in the colour, which is more exact for not being transposed. This simplification guarantees precision as I reconcile two means now become one... It is not a beginning, it is an endpoint." Olympian amusement, twilight bedazzlement, the frivolity of the sage... hasty remarks and judgements about the painted paper cut-outs have proliferated. Indeed, Georges Duthuit acknowledges that there may be some truth in them, a truth "equally applicable to Goethe chatting with Eckermann or to the titanic author of The Magic Mountain leaving an unfinished picaresque novel". 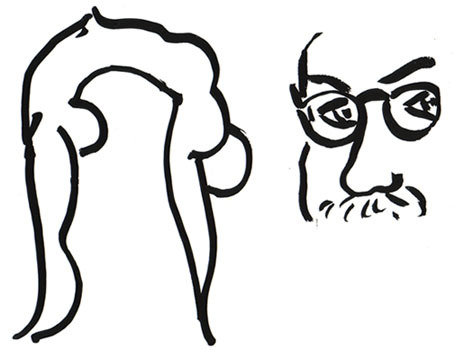 If there is, it is no less true to see in Matisse one of those "great artists grown old" of whom Barres speaks, artists who, "hastening to explain themselves, contracting their means of expression as they shortened their signature", have attained "the concision of enigmas or epitaphs". 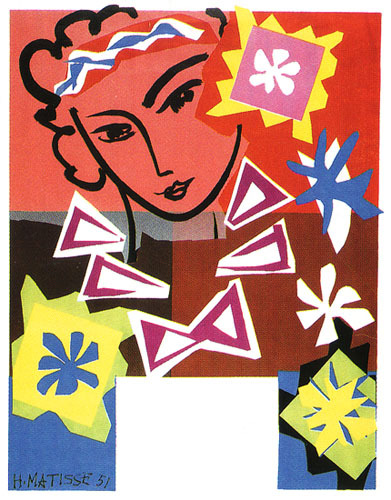 Despite the considerable international acclaim that greeted Jazz, Matisse was not at first satisfied. 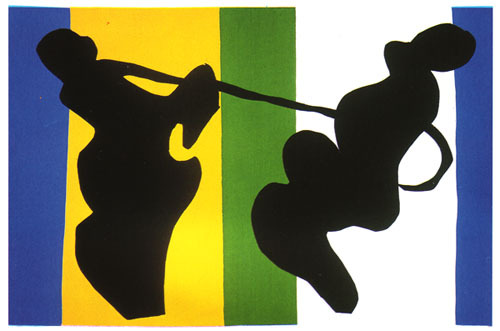 It was some time before he grew used to the transposition by stencil printing to which his publisher Teriade subjected the cut-outs; they could not otherwise be reproduced. 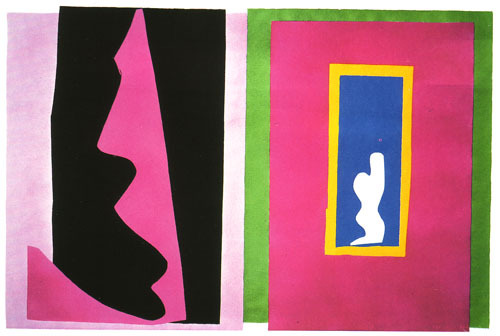 The technique is not perfectly accurate, but it has its use today, for some of the cut-outs have since faded, and we now look to Teriade's stencils for the truth of Matisse's colours. 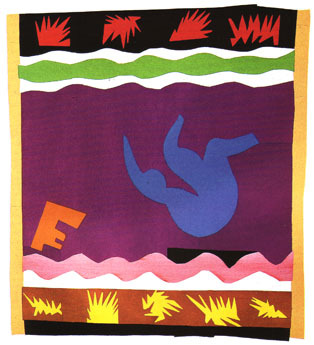 Matisse, in 1944, wrote to Teriade about Jazz, that "this twopenny ha'penny toy is wearing me out and my whole being revolts at its invasive growth!" 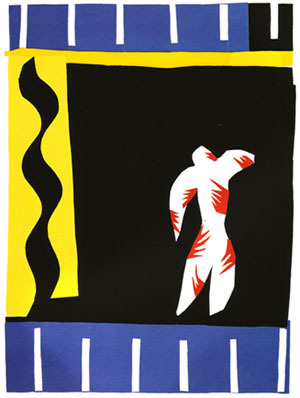 Jazz was published by Teriade Editeur in Paris, in 1947, in a big infolio volume measuring 42 x 32.5 cm. 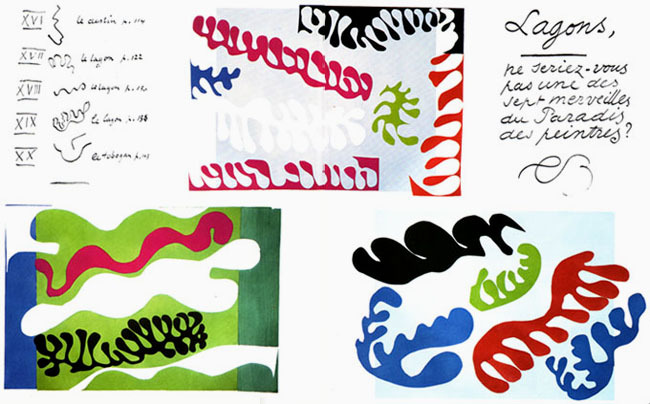 The twenty colour plates were stencil printed in 170 copies after the gouache cut-outs by Matisse, using the same Linel inks as the artist. 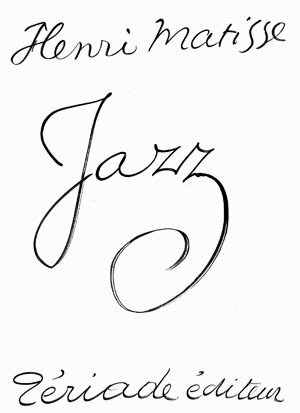 Jazz, offers a complete repertory of forms. The many-pointed stars, the leaves, and the seaweed with its deep undercuts; these recur throughout the plates like a leitmotif. Curiously enough, these same forms, or their ancestors, can be found in a 12th century illuminated manuscript, the Beatus of Saint-Sever. 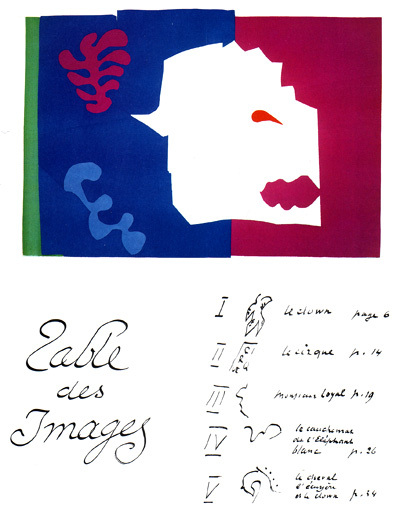 We can be certain that Matisse knew the Beatus, which Mourlot, his engraver, had lithographed. There is no doubt that Icarus and other plates from Jazz owe a considerable debt to the Beams, which was, in its time, one of the major sources of Romanesque sculpture. 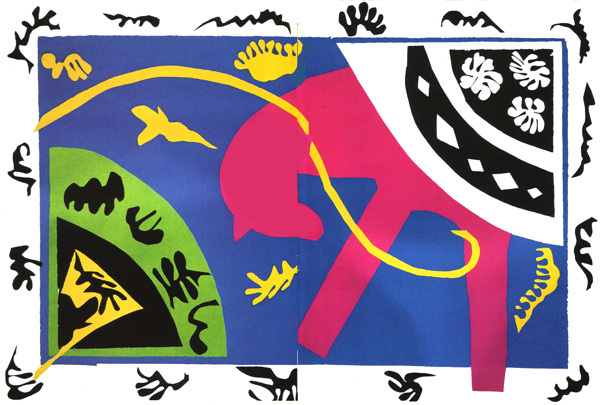 Had not Matisse claimed that he wanted to "sculpt the living colour"?